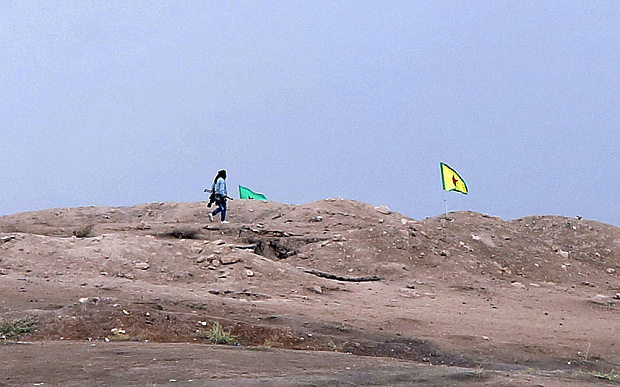 The Kurds managed to reclaim a hill west of the town, taking down an Isil flag visible from the Turkish border which had become a symbol of the advances made by Isil in recent weeks across Syria and Iraq. They were helped by 21 air strikes over two days, the US military said. “Indications are that air strikes have slowed Isil advances,” a statement said. …The dominant political faction in Kurdish Syria, which is leading the fight in Kobane, is a group called the YPG, which is affiliated to the Turkey-based guerrilla movement the PKK. The PKK is Marxist and has been fighting a three-decade war for autonomy against Ankara. It is proscribed by the United States, Nato and the EU as a terrorist organisation. The US clearly regards it as the lesser of two evils in the fight against Isil, but the Turkish government, despite a two-year ceasefire pending peace talks, still remains hostile to its political ambitions and is determined to stop it forging an independent region in northern Syria.